Italian design house and Coke machine ruiners Pininfarina want to make track day laps as guilt-free as a cookie made of air. 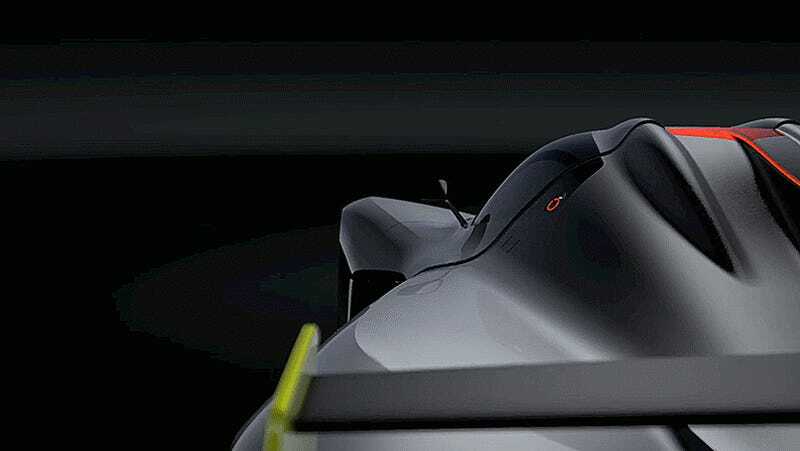 The one-off Pininfarina H2 Speed concept uses hydrogen power to produce around 500 horsepower with zero emissions besides the environmentally friendly by-products of air and water. H2 is, of course, the formula for hydrogen gas, and speed is that thing we enjoy the crap out of. It’s a fitting name for a track day beast! The H2 Speed looks like a fabulous cross between a be-finned Le Mans prototype and Goodyear’s crazy floating tire concept. It features a crazy sardine-can-like pop-open roof in place of conventional doors. Take that, billionaire doors! The H2 Speed takes its snazzy color scheme from a 1969 Pininfarina concept, the Ferrari Sigma Grand Prix. According to Pininfarina’s website, the hydrogen fuel cells powering the H2 Speed are based on already tested Full Power Hydrogen technology from GreenGT. The powertrain includes two electric synchronous motors, one lightweight hydrogen fuel cell and a braking energy recovery system, which harvests power from the car’s lightweight carbon-disc braking system. Underneath that Russ-Hanneman-humbling exterior is a carbon frame that houses two hydrogen tanks, both of which are visible through a window in the fairing next to the fuel cap. A rapid refueling system will let the car’s hydrogen tanks fill up in only 3 minutes. This theme of symmetrical twos extends to the two large front radiators that cool the engine. A center duct in between the two radiators brings air around the cabin to cool the engine compartment behind it. Two air intakes on the engine compartment’s cover help cool the car’s electric motor. The big vertical fin, rear diffuser, side-cut and wing all help keep the car glued to the ground with sweet, sweet downforce. I’m not sure Pininfarina quite nailed their target market of track day warriors with the transmission, though, as many of us like to row our own gears. The car has a direct transmission to its rear wheels, with no clutch or gear shifting required. Torque vectoring makes sure the power goes to the wheels that need it most. The entire package weighs 3,131 lbs—which seems heavy for a carbon-bodied track-only car, but isn’t too far off from the weight of the new Porsche 911R. It also promises a top speed of 186 mph and a 0-100 kph (about 62 mph) time of 3.4 seconds. Those are pretty impressive stats for a car that spits out air and water. Of course, this is still just a concept, and there’s still the very real problem of sourcing hydrogen at track day. Let’s be honest, it’s hard enough sourcing traditional fuels when you’re off in whichever Nowhere Land houses your race track, as a busy track day can easily dry up the closest gas station’s fuel pumps before the day is even over. I can’t imagine there’s a bustling market for hydrogen in the middle of your home track’s cow pasture, and until the infrastructure for hydrogen-fueled vehicles catches up, these concepts will remain a bit of a pipe dream. The idea of only spitting out fresh air from said pipe, however, is a noble goal we can all get behind.